About twice a year, Sur La Table sends out a coupon for $10 off your next purchase. Can I tell you that I look forward to these coupons? I immediately head over to the store and see what goodies they have for me. Well, you can probably tell by that introduction that I got my coupon not too long ago. And whilst I was browsing, I decided to buy something unexpected. A book. A book?!? A book; a Martha Stewart cookbook all about pies, tarts and the like. While not at all vegan, I knew I wanted it for ideas and methods to improve my pie and tart making abilities. I can say that after having just made my first recipe, I love the book! 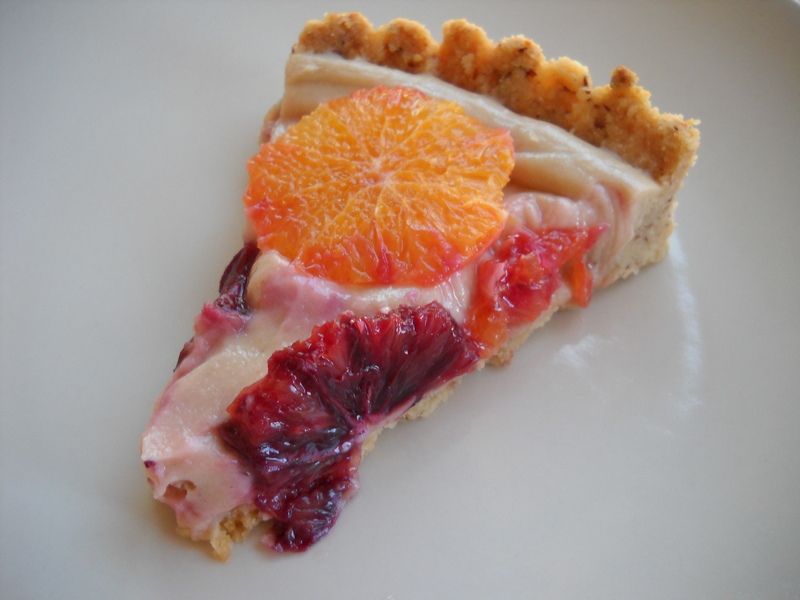 And I love that I get to present you with this Blood Orange & Yogurt Tart. In the book, Martha uses navel oranges, dairy yogurt, butter etc. Here’s the foxed edition for your masticating pleasure. 1 ½ c So Delicious Greek Style Yogurt (I used a combo of vanilla & plain) Sub So Delicious regular coconut milk yogurt if you can’t find the Greek. First, to the crust! Combine almond meal, flour, sugar, and salt. Cut in the Earthy B with a pastry cutter, until you’ve got crummage forming. Press crumbs into a very lightly oiled 8-inch fluted tart pan. Stick in the fridge or freezer for 30 or so minutes. Preheat oven to 350°F. Bake tart shell for 30-35 min until it begins to turn golden brown. Set aside to cool. For the filling, whisk together the yogurt, brown sugar and pinch of salt. In a small saucepan, add the Healthy Top and sprinkle the VegeSet over the cream. Turn on the heat and bring the cream to a boil stirring constantly to make sure the VegeSet is dissolving and not clumping (ew!). Once you bring the mixture to a boil, immediately turn the heat down or remove completely, all while stirring. Add the cream to the yogurt mixture and combine. Pour into the cooled crust and place in the fridge for at least 2 hours to set. When you are ready to serve, grab the blood oranges. Use a pairing knife to remove as much of the peel and pith (white stuff) as possible. Slice oranges into rounds and arrange them on top. 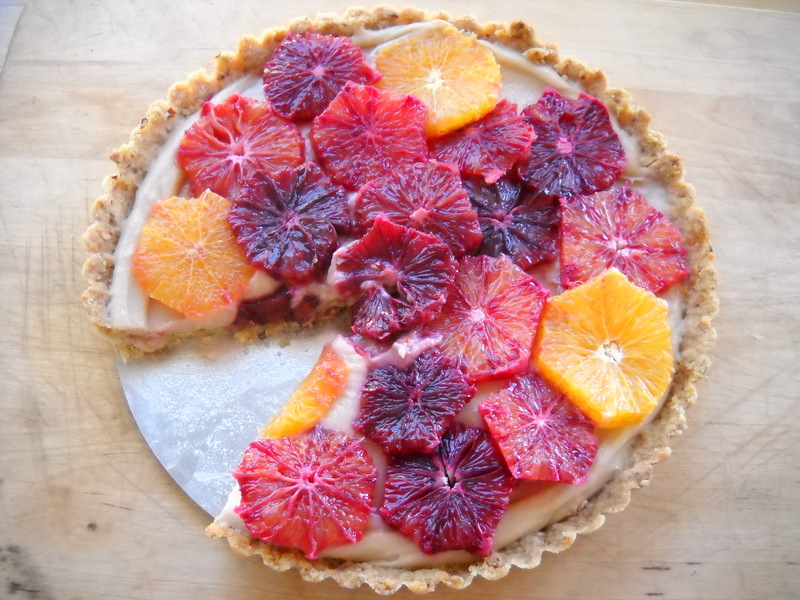 If you’re lucky like me, you will end up with blood oranges that vary in their bloodiness creating some beautiful contrast for the top of this yummy tart. Looks great! Thanks for posting this recipe. Not a big orange fan, but I’m thinking raspberries, blackberries and strawberries on that bad boy instead would do me just right. Ooo, berries on this tart would be just as delicious I’m sure! Strawberries have always been my fav, since I was just a little one. ps–I have been dropping in on your blog but am unable to leave comments on blogger/blogspot blogs at the moment w/ my wordpress id. I guess a lot of other people are having the same issue, which is no bueno because many of my favorite blogs are on blogger! Had to bring that up because I’ve been drooling over Mohawk Bend’s Avo & Fries on your page! Must venture over there to get that dish in mah belly! I love that book, there’s so many creative ideas in there. Your tart turned out beautifully, I so wish we could get that greek coconut yogurt here. It seems that Canada is always a year behind everybody else when it comes to new vegan goodies. The recipe is really great. I tried it and found it is very tasty. But not beautiful as your images. I thought you were going to say you got a new tart pan. 🙂 The tart looks super yummy, love the colors of the blood oranges! Martha’s books are great, I’ll have to look for that one. Haha, I think I need to get some mini tart pans. Thanks, Martha’s book is very inspiring!